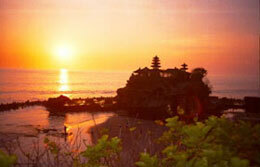 Tanah Lot Sunset Tour - This is one of the compulsory tours to see some of the most beautiful temples of Bali. One of the most popular place in Bali. We will stop at Mengwi the magnificent Royal Family Temple of Taman Ayun (XVII century), surrounded by an artificial moat. 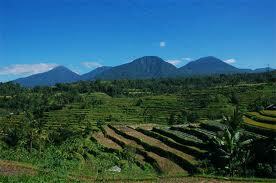 Next we will stop at Pacung, a nice view of natural plantation with Mount Batukaru as its background. After that we will explore Bedugul, a mountain resort lies over 1.000 meters above the sea level. 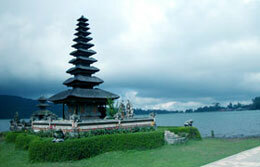 Afterward we will stop at Ulun Danu Bratan Temple. Built on a promontory surrounded by lakes water, this holy place is dedicated to Dewi Danu (the God of Water). Continuing the trip, we will visit to Alas Kedaton, the flying fox and monkey forest. Our last destination is Tanah Lot, The Rocky Temple on the sea which appears in every brochure on Bali. This lovely temple was built on a promontory offshore, truly a perfect setting to watch an Amazing Sunset (weather permitting). Note: Times are only suggested times and can be flexible to stay longer at a place you might like to and miss something else you may prefer not to visit.